One of the popular genres in science fiction is alternate history – writing of history of the world as it would have happened if outcomes of some of the biggest events in history had been different from what actually happened. What is Hitler’s Germany had won World War 2? What if Columbus had not found America when he did? What if Alexander Fleming had not recognized the significance of his discovery? All these what ifs can make really interesting reads. Dog eat Dog Food World is one such alternate history stories. (or pseudo history as the author calls it.) It does not change any big event in history but is a satire that traces the origin of marketing management concepts to a ludicrous marketing battle between two tycoons selling dog and cat food. The story takes an irreverent look at many of the things that we ascribes an undue amount of importance to, both at and individual and at a broader society level. Ever since the whole world has become a ‘Made in America’ world, marketing has become a buzz word. Everything is about consumerism and marketing gimmicks. Suresh, in his book, brings out the parody of this whole crazy consumerism by showing how marketing gimmicks can make as non-glamorous a product as dog food look like something no human can just live without and how entire set of social behaviors and sub-cultures can be driven by these marketing campaigns. While the exaggerated narrative brings a few laughs, the impact marketing had had on human society is so true as well. The book makes one stop and reflect how most of what we take for granted are probably driven by marketing campaigns. The main characters in the story are an interesting study of what drives people to make their professional and life choices. 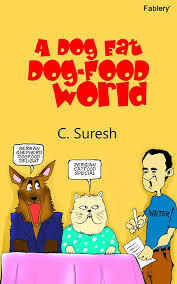 While the book raises some important questions, it can make a light breezy read for the non –serious reader as well with its slap stick humor around the misadventures of the main characters, who get mauled in all possible manners by the titular protagonists of the book – the dogs and the cats. The author has given lot of attention to details such as the names of the characters. If a reader were to read carefully, he or she would discover an additional layer of humor hidden between the lines of the main story that takes a swipe at some of the popular marketing campaigns over the last few decades. One thing a typical reader, used to the plot or character driven stories, might find unsettling is the unconventional theme and narrative. Also most of the current generation’s minds are numbed by the same glitz and glamour of consumerism that this book takes on. In a world where mediocrity in entertainment is worshiped on every media and potty jokes and double entente pass for good humor, I have my own doubts as to how well a book like this will do. Anyways optimism never killed anyone. As I close, I will have to mention I might not have picked this book at all but for the fact that author happens to be a close friend of mine. But having read it, I must say the book ranks among some of the very best in classic humor and it is definitely worth a read friend or no friend. So I would put my neck out and recommend this book to everyone who reads my blog and those who don't as well if you happen to have stumbled on this one and managed to hang on till here. Here are the links to the e-book on Amazon, India and Amazon global as well as that of the paperback book if you are one of the traditional ones addicted to the smell of paper and print and are based out of India. Thanks TF! Satire, I know, is not everybody's cup of tea but what can one do; one writes what one can write and not what one thinks will sell :) All I am interested in is that the people who believe that what I write will be interesting do not get disappointed and, going by what you have said, I am happy that THAT at least is likely to happen. Thanks Usha - That is nice to hear. It is very difficult to make an interesting to read - become more difficult to be interesting and objective when the author happens to be your friend. Glad you enjoyed the book as well. Waiting for your review. Definitely want to read Suresh's book TF. Just was inquiring with Suresh, if there was a kindle version available. You must, Asha. The link to the kindle version is there in the post.